WORLD COLOR's pop'n music banner. A long, slightly re-arranged version of WORLD COLOR appears on 猫叉Master's third album, Crevice. 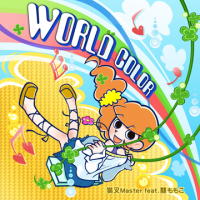 WORLD COLOR is the first original 猫叉Master song since Echoes to be part of the default songlist in a pop'n music game. On the pop'n music Sunny Park location tests, WORLD COLOR's artist was credited to just 猫叉Master. WORLD COLOR had a 5-Button chart in the pop'n music Sunny Park location tests. It was replaced with a brand-new EASY chart in the final version. SANAE♥chan, Reo-kun and Sugi-kun make cameos on RIE♥chan's WIN animation. ※ The notecount of this chart is different from the final release (total notes: 220). This page was last edited on 19 December 2018, at 19:34.